Readers sometimes ask me to suggest a destination where they can retreat from the world. Not someplace rustic or too remote, yet far enough removed that they can reconnect as a couple or get away solo to reflect or even to heal from anything from one of life's curveballs to a major trauma. They are seeking a safe, welcoming, soothing haven, where the demands and responsibilities of life fall away, and the pace of the day is dictated by whim and wonder. After a single night on an island in Maine in July 2011, I now know the Chebeague Island Inn can provide this respite, while also serving as the backdrop for an active, picturesque and truly memorable getaway. I travel all the time, but I was still slightly flustered at the prospect of driving to Maine, catching a ferry, crossing Casco Bay and exploring an island alone: especially since--I'm embarrassed to admit--it had been 10 years since I last pedaled a bicycle. As it turned out, the ferry was a piece of cake, the Chebeague Island Inn's lovely and professional staff made me feel completely catered to and at home, and riding a bike is, well... just like riding a bike! After an afternoon of swimming in the ocean, biking to a clam shack and strolling past charming houses to a quiet cove, and an evening of savoring lobster corn dogs and mint chocolate chip cookies warm from the oven while watching one of the most spectacular New England sunsets I've ever beheld, I slumbered deeply... weary not from mentally taxing to-do lists but from exertion... and woke with the daylight, refreshed in spite of the early hour. I knew in that moment I'd had the rare chance to rediscover the rhythm that suits me. the Chebeague Transportation Company's Chebeague Island Ferry departing from Yarmouth, which, if you ask me, is the only way to go. After researching my options and speaking with a helpful staff person at the Chebeague Island Inn, it became obvious that taking the ferry from Yarmouth would be cost-effective and stress-free. The Chebeague Island Ferry operates year-round and offers frequent departures (see schedule), so missing one boat doesn't mean your vacation will be delayed for hours. The cost as of 2013 is just $15 round-trip. It's an additional $15 per night to park at the ferry's satellite parking lot on Route 1 in Cumberland--$10 per night less than it's likely to cost you to park in downtown Portland. From there, a bus takes you to the ferry dock in ample time to board the ferry for a quick, 15-minute trip to Chebeague Island. A bonus: This is the ferry service most often used by islanders--who all seem to know each other--so you'll overhear authentic Maine accents and learn a bit about island life as you cross Casco Bay with residents who've been to Yarmouth to stock up on provisions. It's just about a two-hour drive from Boston to the Chebeague Island Ferry parking lot, three hours and 45 minutes from Hartford, Connecticut. The Chebeague Island Inn dates to 1920, when the original Hillcrest Hotel built on the site in the 1880s was reconstructed following a devastating fire. The classic three-story, Greek Revival-style inn's yellow paint is authentically weathered, yet cheery; its expansive porch is an inviting place to spend a summer eve. There are only a handful of century-old grand hotels in New England, and they've been renovated and reimagined with varying degrees of success. 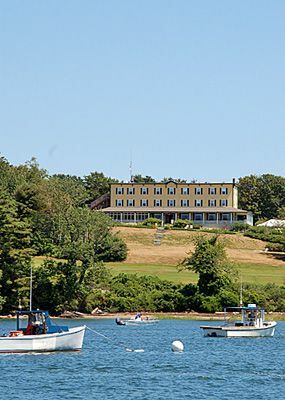 The Chebeague Island Inn, which underwent restoration in 2004 and has been in the loving care of mother-son hoteliers Gerry and Casey Prentice since 2010, is one that has managed to evolve without its essence being erased, its charms marred. Yes, there is WiFi property-wide, and cell phones work perfectly, but the board games and original Nancy Drew mysteries on the shelves of the stone fireplaced Great Room and the croquet court on the seaside lawn are more worthy diversions. The restaurant serves creative dishes, yet the emphasis is on local ingredients and the freshest Atlantic catch. I always relish the chance to stay at a property that retains its aura of earlier times and the spirit of those who have crossed its thresholds since the days of steamboats and Jazz Age soirees. But old hotels can admittedly have drawbacks for some travelers. Chebeague Island Inn has no elevator, so you'll need to ascend at least one flight of stairs to your room. And although the inn's lack of air-conditioning is rarely an issue, you may find your accommodations sweltering in the event of a summer heat wave. I arrived at the Chebeague Island Inn a bit before the 3 p.m. check-in time, but my ocean view room with a private bath was ready. I was relieved, as I had decided to make the five-minute hike uphill from the ferry dock to the inn under the unusually intense sun of a late July day, rather than request a ride and assistance with my bags. The only service glitch I experienced during my stay was a mix-up with my bags, which the bellman stored instead of delivering to my room. With no room phone, I had to descend the stairs two flights to find out why my luggage had disappeared. The Chebeague Island Inn's 21 rooms are lovely in their clean palettes and airy simplicity. Each is furnished with unique antique accent pieces and decorated with evocative works by Maine artists. There are no televisions. The inn operates seasonally, mid-May through early October, and guests can opt for six different room configurations, ranging from a garden view room with a shared bath to a two-room suite, which can accommodate families. Overnight rates range from $147 to $430 per night including a full breakfast as of 2013 depending on the room selected and the dates of your stay. One of the things I love about the Chebeague Island Inn: no minimum stay requirement. So, it's a perfect option for travelers with limited time or funds who want to make the most of a one-night escape. Be aware, however, that the inn's cancellation policy is not terribly generous. With ocean-salted breezes floating through my windows and an added air-moving boost from an antique electric fan, I slept blissfully on a cloud of down, even though the night was warm. When the sun woke me--shortly after 5:30 a.m.--I realized the room had no clock, and while I had set the alarm on my cell phone, it was charging in the bathroom. Although daybreak was a clue, I had no real notion of what time it was, and I was surprised when I realized I'd awakened so early, yet didn't feel exhausted, as I usually do when I'm jolted awake at 6:30 at home. This natural, rested start to the day made me wonder if I should adjust my sleep habits, hitting the hay earlier and waking with the first rays. You won't have your own car on Chebeague Island, and that means you'll rely on your own power to take you most places. From the Chebeague Island Inn, the nearest public beach--Hamilton Beach--is about a 10-minute walk. A 15-minute ride on one of the bicycles the inn freely provides will take you to Calder's Clam Shack. It had been a decade since I was last on a bike, and although there was one uphill stretch that was a doozy, I felt completely safe bicycling the short distance around the corner from the inn with the scent of fried whole bellies coaxing me on as I neared Calder's. Respectful motorists share all roads on Chebeague Island with bicyclists and pedestrians. In fact, almost without fail, everyone you pass greets you with a friendly wave. Although the island only has about 400 permanent residents, its population multiplies tenfold in the summer months. The Chebeague Island Inn's fleet of bicycles is about to be upgraded, I'm told, with the purchase of new L.L. Bean Cruiser bikes. The chain was loose on the bike I rode, and I chose it over two other women's bikes that were in worse condition. Bringing your own bicycle to Chebeague Island costs an additional $3 each way on the Chebeague Transportation Company's ferry. Chebeague Island Inn guests also have access to complimentary van transportation to any island destination they'd like to explore. After I settled into my room, the first thing I did was ask at the front desk for a ride to the most photogenic Chebeague beach. Chebeague Island is just 5 miles long by 3 miles wide, so although I spent less than 24 hours exploring, I was able to experience the majority of the island's highlights. One of the best things to do on Chebeague is to laze away hours at one of the island's half-dozen beaches. The Chebeague Island Inn provides beach chairs and towels, and the moment I settled into a spot on the sand at Indian Point--known to locals as "The Hook" for its shape--I regretted I'd asked the inn's shuttle driver to return for me in a mere 45 minutes. I saw less than a dozen other people during that time, and as I trained my lens on the remarkable views, I found it difficult to conceive that this spot was in Maine. The grassy sand dunes were Cape Cod-esque, the waters a tropical blue. It was only when I ventured into the chilly water that I came to my senses: This was definitely Maine. Energized from my brisk ocean dip, I biked toward Calder's Clam Shack, stopping en route to peek in the door at the Museum of Chebeague History, which is housed in an 1871 schoolhouse. Although it was past closing time, I was invited inside for a quick look at the exhibits, which focus on the island's late 19th-century transformation into a tourist destination. At Calder's, I debated between fried shrimp and fried clams, and while the enormous battered clams I opted for were only so-so, the appeal of this tiny outpost was evident. It was late afternoon, so most other patrons at picnic tables were savoring Maine-made ice cream. After returning my bike to the rack, I walked a few blocks past charming yet modest island homes to Hamilton Beach. Before hopping a ferry back to the mainland the next morning, I took the inn's shuttle to another island must-visit: The Niblic. Chebeague Island's general store stocks everything from souvenirs to works by local artists, from food staples to wine, and it's the island's coffee shop and boatyard, too. I purchased a lobster note card and a pair of lobster earrings crafted by an islander, then read the notices posted on the store's bulletin board. You know you are on an island when the flyers tout private sailing lessons, clams for sale and a charitable way to unload your boat. Guests of the Chebeague Island Inn have several other recreational options, including access to the 9-hole course at the Great Chebeague Golf Club, which was designed in 1920, and to the clay tennis courts at the island's Recreation Center. Complimentary fishing poles are available for those who'd like to try casting from the inn's docks. Island outfitters rent sea kayaks and boats, and if you run out of things to do on Chebeague Island, you can take a water taxi or ferry to a neighboring island, such as Great Diamond, where you can savor a meal at Diamond's Edge Restaurant. All of the sustenance you need can be found right at the Chebeague Island Inn, where the fine dining restaurant serves breakfast, lunch, dinner and Sunday brunch not only to overnight guests but to visitors who make the trip across Casco Bay for no other reason than to enjoy a standout meal. Executive Chef Justin Rowe tweaks his menus frequently to feature in-season local ingredients and the freshest sea fare. Since I was dining alone--and had consumed fried clams at 5 p.m.--I decided to forego dinner, which is served both indoors and on a screened porch with superior views. The Chebeague Island Inn offers the perfect alternative for those with lighter appetites or solo travelers: The Sunset Landing menu, served Tuesday through Sunday on the inn's sweeping, waterside porch from 2:30 to 9 p.m., features delectable nibbles that pair perfectly with a cocktail, beer or glass of wine. I contemplated simply ordering the Artisan Cheese and Charcuterie Plate... until my convivial waitress reminded me that you can't have Lobster Corn Dogs just anywhere. I savored every bite of these enormous lobster claws fried in sweet batter and paired with a sun dried tomato aioli that had a flavorful kick. And, because I couldn't tear myself from the show the sky was putting on as the sun sunk, I ordered a plate of warm-from-the-oven mint chocolate chip cookies and tried with limited success to convince a trio of boys playing croquet on the lawn to share them with me. The next morning, I took a seat on the screened porch and watched as an aggressive fog rolled in, shrouding the island in just 15 minutes while I savored a plate of eggs, crispy sweet Apple Wood smoked bacon and Maine maple grits (which I had to return to the kitchen to be warmed). The inn was quiet on this Monday morning, with only four rooms occupied, and seemed even more haven-like. I packed plenty into my short stay at the Chebeague Island Inn and captured truly exquisite scenes with my camera, but my favorite memory is one I recorded only in my mind. As I nestled into a porch chair to savor gooey cookies and the final dazzling sunset colors, there was a small commotion inside the screened dining area. Three generations were celebrating a 50th wedding anniversary, and the long-married couple's children recited a rhyming poem about their decades together--the joys, the trials--equally meaningful when recounting a life shared. It brought tears to my eyes. When the poem concluded, there was a congratulatory toast, and a man's voice rose above the celebratory din, cautioning that this all might be premature: "Our anniversary isn't until the ninth; we might not make it," he quipped, and I laughed along with this family of strangers, who will always have that moment. Chebeague Island doesn't have highways, traffic lights, nightlife, sophisticated shopping or even a movie theater. The Chebeague Island Inn doesn't have a spa, a television, room phones or even alarm clocks. But a stay--however brief--may be the wake-up you need, the reminder to take life in stride, to trust your intuitions and abilities, to laugh and to soak up places and experiences with your heart and your mind so they will be even closer than a 15-minute ferry ride whenever their solace is required. For inn or restaurant reservations, visit the Chebeague Island Inn Web site, or call 207-846-5155.